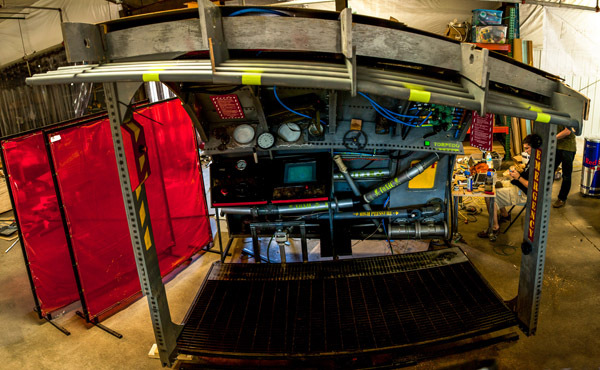 The game employs 3 Arduino micro-controllers that simulate the attack of a submarine, which is built to the scale and likeness of a real submarine. There are various levers and valves that the user must trigger to repair different threats to the submarine, such as a high pressure hull rupture, radiation levels, reactor temperature, or a depth charge. Cute as can be, depth charges are sent via remote Twitter users, as are torpedoes when enough tweeters get #firetorpedo trending during gameplay. The submarine design was drawn up in Sketchup, and cut out using a Shopbot CNC machine. 1.21 Jigawatts used an old hospital bed actuator to make the sub rock back and forth, and there’s a vibration motor that simulates the torpedo attack. 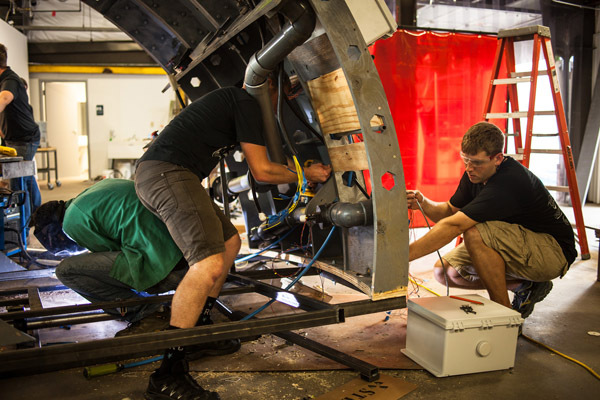 The structure of the submarine was drawn in Sketchup, and cut out on a Shopbot CNC machine. We then salvaged nearly everything you see on the submarine, from the LCD display, to the pipes, and the metal grating on the floor. The whole submarine rocks back and forth with an old hospital bed actuator. An LCD screen sits inside, on which you can follow the path of an incoming torpedo. There’s also a voice command (powered by an Adafruit Wave Shield) telling you which buttons, valves, levers to press. If you fail, valves begin to break as the sub rocks back and forth, at which point you need to close them manually. The best part? If you can’t repair the submarine and evade the enemy in time (2 minutes), you will be sprayed and splashed with quite a bit of water. Only agile, quick, and sharp helmsmen emerge dry. You can check out all of the other contestants on Red Bull’s awful website and vote by clicking here.